Contains 5 x 20cl bottles of Delamain Cognac - all from the Grande Champagne terroir, well-aged and of superb quality. Each expresses rancio, and is exceptionally mellow, fruity, and aromatic. 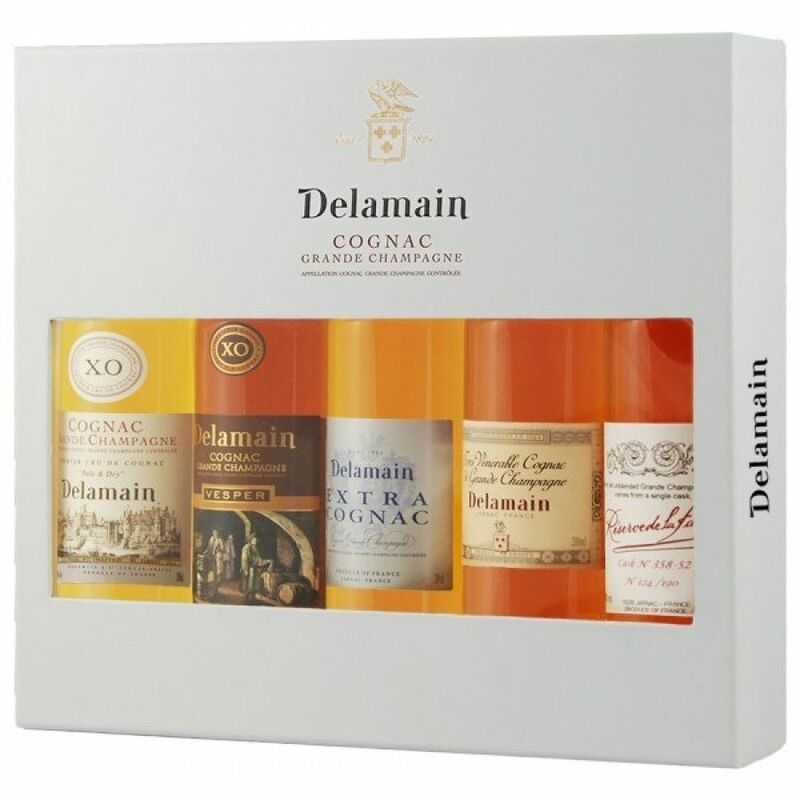 The Delamain Pack Collection Tasting Set comprises 5 x 20cl bottles of wonderful Grande Champagne Cognacs from the house of Delamain. If you've not yet been introduced to Delamain, this is a wonderful way to sample their wares. 1. The Delamain Pale & Dry XO Cognac: This gets its name thanks to the fact that it's much paler than other Cognacs of this age and quality. The color is totally natural, and the eaux-de-vie are all matured in old casks. The 'dry' refers to the sweetness, which is very dry and natural. A delicate, lengthy Cognac that delights with its fruitiness and mellow nature. 2. The Delamain Le Vesper XO Cognac: Round, full of body, mature, with a wonderful length of finish. Enjoy the scents of dry vine shoots and vanilla. Wonderful rancio that you only get with a Cognac of true age. 3. The Delamain l'Extra de Grande Champagne Cognac: A perfect expression of why Grande Champagne is the premier cru of the region. Full, mellow, mature, complex, and fruity. 4. The Delamain Le Très Vénérable Cognac: So named due to its 'venerable' status - thie maximum age up until which a Cognac can improve. This is extraordinarily delicate in such a rich and flavorful Cognac. Powerful perfumes and intense and complex on the palate. Delightfully mature. 5. The Delamain La Réserve de la Famille Cognac: Proud to give it the name 'Reserve de la Familie', this is an exceptionally rare Cognac - one that the Delamain family say they reserve for guests and friends. Rich, complex, refined... This is a truly extra-special Cognac. this tasting set features the 5 best cognacs by Delamain. If you consider Cognac, and if you are into spirits.. go for this great cognac collection.